The marriage of Queen Victoria to Prince Albert bought about huge changes for Christmas, as it once was. Up until this point it hadn’t really been recognised as a holiday by businesses and the act of giving presents was something that was reserved for New Year. With the newspapers sharing insights into the newly married royal couples life, the Christmas period was changed forever. Decorating a Christmas tree was a tradition Prince Albert bought over from his German childhood. Although evergreen trees have been used since medieval times during the Christmas period, the use of decorations was limited to twigs and sprigs around the windows and walls. However, a drawing of the Royals and their young children gathered around their beautifully decorated Christmas tree, appeared in the newspapers in 1848. Filled with sweets, candles, decorations and small gifts, the tree captivated the Victorians. Suddenly, it became fashionable to have a decorated tree at Christmas. The first advertisements for tree ornaments were introduced in 1853, as factories made mass production possible. By the 1880’s uniformity was key for the tree and home decor during Christmas, Magazines were even publishing strict instructions for the lady of the house to ensure each room was decorated to bring about a feeling of joy and general enjoyment! Although Christmas cards were invented by Henry Cole in 1843, they were still too expensive for most Victorian families. However, this didn’t stop the children wanting to create their own – something the Royal children also enjoyed doing. Sending cards through the post became incredibly popular by the 1880s, as postage costs dropped and printing processes improved and it became a normal Christmas tradition for everyone. With the introduction of Christmas wrapped sweets, by confectioner Tom Smith in 1848, the Christmas cracker was born. He loved the idea of wrapping several sweets inside a paper wrapper, one that would ‘snap’ when pulled apart. 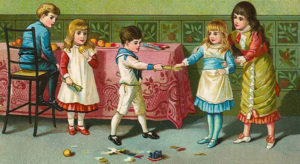 The sweets were replaced with small gifts and paper hats in the late Victorian era – giving way to the modern Christmas cracker, as we know it. The act of giving gifts was moved from New Year to Christmas, as the holiday period became more family-focused. Presents also grew in size, meaning they needed to be stored under the Christmas tree. Up to this point, traditional presents consisted of small gifts, such as handmade trinkets, sweets, fruit and nuts, but these were replaced by larger, shop-bought gifts. The Victorians made Christmas a family affair, as the new railway networks enabled families to come together. Families gathered around the table to enjoy a Christmas feast together. Mince pies, traditionally made with meat, were replaced with meatless mixes. Roasted turkey replaced beef and goose as the centrepiece, and carols were revived as the most pleasurable of entertainment. 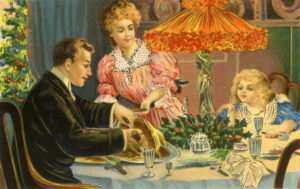 Carols, along with parlour games and the act of giving out presents, became traditional Christmas entertainment that the entire family could enjoy. 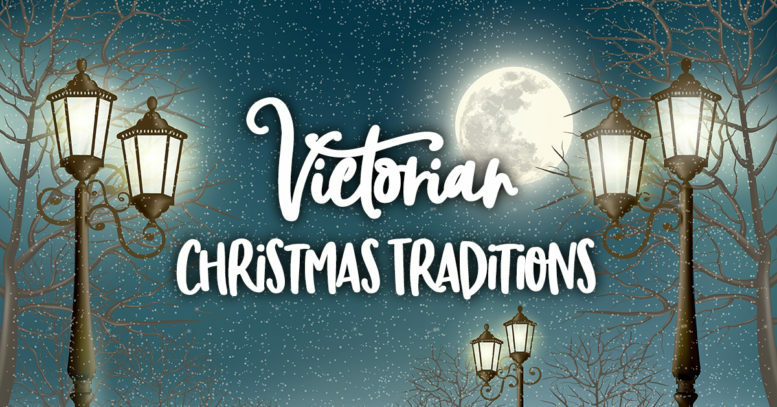 The Victorians made Christmas something to celebrate and enjoy. Door-to-door carol singing enabled families and friends to get outside and spread the joy, whilst toys became more affordable, due to mass-production in the new factories. Many parlour games and carols enjoyed by the Victorians, are still popular today and, spending time with family over a lavish feast, is a Christmas tradition many of us (despite countless jokes and quips to the contrary!) still enjoy to this day. Get your latest news updates here! Subscribe to our email list and be amongst the first to get the latest news, entertainment alerts and special offers. Great location for Wembley, West End and Harry Potter. Subscribe to our email list and get the latest news, entertainment alerts and special offers. ©Grim's Dyke Hotel. All rights reserved.